Nadi International Airport, Fiji’s flagship airport and the regional hub of the South Pacific, has been ranked as one of the World’s Most Improved Airports. The accolade came during the prestigious Skytrax 2018 World Airport Awards, which was held in Stockholm, Sweden last week. The Skytrax World Airport Awards are the most prestigious accolades for the world’s airport industry. It represents the global benchmark of airport excellence. Attorney-General and Minister for Public Enterprises Aiyaz Sayed-Khaiyum celebrated the award, saying that it was testament of the growing strength of Fiji’s aviation industry, tourism sector, and economy. “When the Bainimarama Government put in place the Nadi Airport Development and Modernisation Act, many were quick to politicise and attack the reforms, and did not understand Government’s vision for bringing the aviation sector in Fiji into the 21st century. This award, and the state-of-the-art airport that earned it, should dispel any doubts–– it is proof that our vision bringing Fiji to new heights. We look forward to continuing to build upon this progress, and to sharing the benefits with all Fijians,” he said. “Nadi International Airport is more than just an airport—it is a gateway to Fiji, and to the entire Pacific region. It is where the first and last impressions of Fiji are made as tourists, world leaders, and businesspeople enter and leave our country,” continued Sayed-Khaiyum. In the rankings, Nadi International was one of just 10 airports in the world that earned the “Most Improved” distinction, placing 6th overall. Other award winners in this category included airports in world capitals and mega-metropolises like Rome, Perth, Athens, Montreal, Moscow, Manila, and Houston. 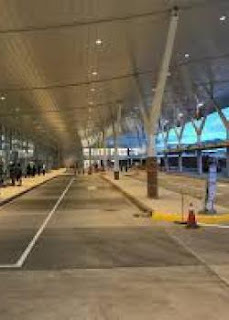 Fiji Airports Executive Chairman Faiz Khan said it is an amazing achievement to be ranked alongside the biggest and best airports in the world. The $129 million (US$63.3 million) Nadi Airport terminal upgrade project was completed in April of 2017. The airport now features a two-lane departures drop-off area, a bigger, high-ceilinged departures terminal, self-check-in kiosks, an expanded departures immigration area with additional counters, a brand-new departures lounge with world-class duty-free shopping, a kids’ play area, a prayer room, a smoking lounge, brand new airline lounges, an expanded arrivals landing area with additional immigration counters, additional carousel, and more. Fiji Airways also unveiled its new, state-of-the-art business class lounge at the airport in December.